While I was checking out the DK-19 F4H Auto-Incline Treadmill, I noticed that it had confusing descriptions. 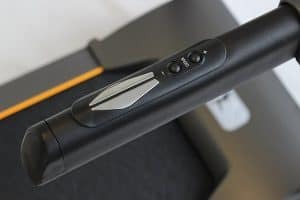 Nonetheless, I gave it a chance as at first glance it looks like a really sturdy piece of equipment offered at a low price – because of the discount! At less than £300 (at the time of writing), this treadmill already has a comf0rtable running area, an entertainment system, and a wide selection of exercise programmes and settings. Plus, it can hold users of up to a maximum of 110kg! With all that said, let’s take a closer look at this treadmill to see if it’s really worth adding to your home gym. The DK-19 F4H Auto Incline Treadmill obviously looks more robust than other models within its price range. It has thick handlebars and a large display with easy to navigate buttons. 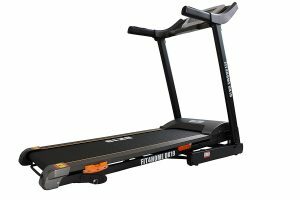 This running machine is powered by a 1.75HP motor that can keep up with fast-paced running, and it has an impressive running area size that measures 140 x 40cm – larger than most treadmills within the same price range. 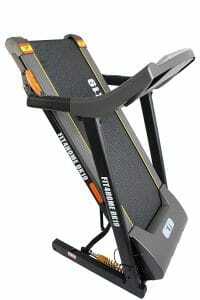 And as mentioned, it has a maximum user weight of 110kg which indicated that it’s a sturdy treadmill. Monitoring your heart rate is important if you want to make the most out of every workout session. With the DK-19 F4H Auto Incline Treadmill, there are pulse sensors on the handlebars so you can easily keep track of your heart rate. Alongside the pulse sensors on the handlebar are the quick speed buttons that let you adjust your speed up to a top speed of 14 km/h. This treadmill also has adjustable auto-incline of up to 5% and it has 12 built-in programs to help you attain your fitness goals. Your time, speed, distance, heart rate, and calories all appear on the large backlit blue LCD monitor. For its current price, the DK-19 F4H Auto Incline Treadmill is an excellent choice as it has a 6-level shock absorption feature that lessens the impact on your joints whilst running. It claims to have a total of 14 shock absorbers that will help you work out longer. 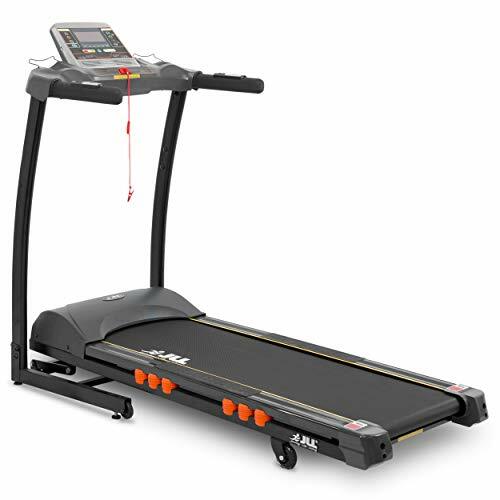 Aside from having a spacious running area, the belt of this treadmill is made of a rubber material that’s anti-static and creates minimal noise. 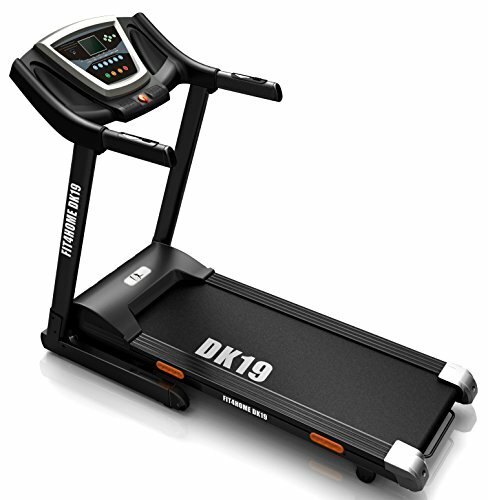 You won’t be getting earphones in the way when working out on this treadmill as the DK-19 F4H Auto Incline Treadmill has onboard stereo sound speakers to keep you entertained. You can play your favourite workout playlist through the USB port or connect your smartphone to the AUX cord. The treadmill has full audio controls so you can turn up the volume as you keep your heart pumping. With a weight of 65kg, this robust treadmill may be too heavy for one person to lift. But you don’t have to worry because the DK-19 F4H Auto Incline Treadmill is assisted with a hydraulic pump everytime you fold and drop it. On top of that, this treadmill is simple and easy to maintain so you’re guaranteed that it will last for a long time – even with regular heavy use. 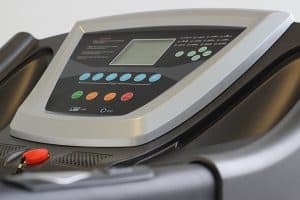 Some customers say that the instructions included in the DK-19 F4H Auto Incline Treadmill are quite hard to understand, which is a common criticism on a lot of treadmills. However, since the product is also delivered with a majority of its parts already pre-assembled, instructions won’t be a big issue and you should be able to hop on the treadmill in no time. The JLL S300 Digital Folding Treadmill is currently Amazon UK’s bestselling treadmill and a lot of customers are raving about this product. 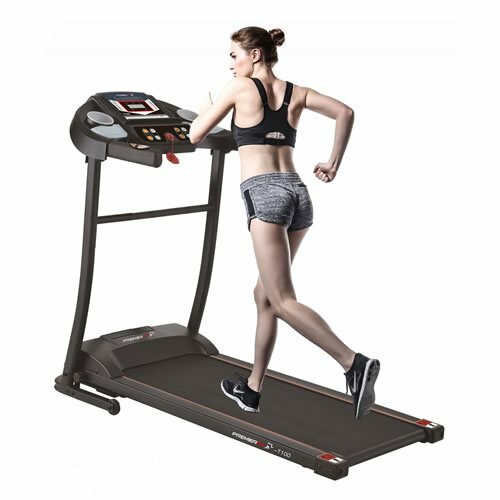 It has a spacious running deck that measures 122 x 40 cm, but the DK-19 F4H Auto Incline Treadmill has a wider running area of 140 x 40cm. Nonetheless, this treadmill has an extremely comfortable running belt with a 16-point shock absorption system. It can hold more weight than the other treadmills as its maximum user weight is 120kg, so you’re guaranteed that this is also a sturdy running machine. The JLL S300 Digital Folding Treadmill has an advanced entertainment system with high-powered speakers, 15 workout programs, 20 levels of incline, and a top speed of 16 km/h. All these features are included in a mid-range priced treadmill which makes it a crowd favourite. JLL S300 Digital Folding Treadmill Detailed Review? CLICK HERE. While if you’re not yet ready to splash out on a mid-range treadmill, the PremierFit T100 Treadmill might be the right one for you. It almost has the same features as mid-range treadmills but is offered at a lower price. This running machine has built-in pulse sensors and speakers that are rarely included in models within its price range. It also has 12 built-in workout programmes and three user-defined programmes, and its top speed is at 10 km/h. However, it doesn’t offer any incline levels but has a fixed 4% incline which gives a very slight slope that helps protect your joints when running. Also, the maximum user weight is only at 90kg but satisfied customers say that it can hold up to 100kg. PremierFit T100 Treadmill Detailed Review? CLICK HERE. With the Confidence EPS Heavy Duty Motorised Treadmill, the price you pay doesn’t depend on the features, but on the durability of the machine. With only a top speed of 12km/h, four auto-incline levels, and a 12 fitness programmes, you might think it won’t be good value for money. But this treadmill is driven by a 2HP motor, and its maximum user weight is at 150kg – which means it will last you a lifetime. In addition, it also has four pulse sensors, located on the handlebars and below the console, so you can accurately keep track of your heart rate. Confidence EPS Heavy Duty Motorised Treadmill Detailed Review? CLICK HERE. If you’re not interested in having a lot going on with your treadmill and you just want to get an effective workout, this model could be the one you’re looking for. The Olympic 2000 Premier Treadmill – TF-370 Model is a simple running machine that has 12 built-in workout programmes, a top speed of 14km/h and pulse sensors on its handlebars. It’s driven by a 1.0HP motor and has a running area size of 120 x 39cm. 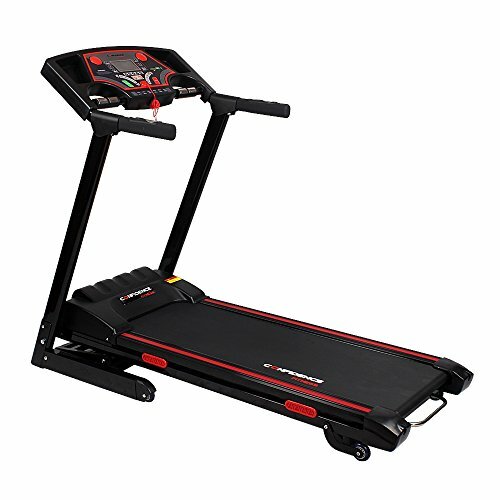 Adding incline levels to your treadmill helps burn calories faster and this treadmill offers a maximum of 15% incline. The maximum user weight of this treadmill is at 120 kg which means it’s stable and various users can workout with it. After reviewing and comparing the DK-19 F4H Auto Incline Treadmill, I still think it gives excellent value for its price. You get a functional treadmill that provides a challenging workout, entertainment features and is likely to last a lifetime. Whether you’re planning to buy a treadmill for weight loss, training, or muscle building, the DK-19 F4H Auto Incline Treadmill can surely help you reach your fitness goals.